Three great sitarists blossoming in the second half of the last century—Ravi Shankar, Vilayat Khan and Nikhil Banerjee—enriched our instrumental music tradition decisively. Their personalities, largely shaped by their background and upbringing, were very different, as was their impact on the public psyche, at national and international levels. But for his untimely death, Nikhil Banerjee would have also had a much wider audience and perhaps been as acclaimed as the other two. Unfortunately, in much of our public space we tend to reduce such talents into a binary of who is greater: Ravi Shankar or Vilayat Khan? It is a pity that even Vilayat Khan (1928-2004) could not rise above petty jealousies invoked by the fame of his compatriot. Certain instances have been recorded by Namita Devidayal, author and journalist, in her impressive book where Vilayat Khan had acted in a manner that would have perhaps behoved a lesser mortal. The ghost of Ravi Shankar’s global recognition seems to have disturbed him much of his life. Devidayal’s book, based on her interest in the subject and research on the life, time and music of the maestro, provides a wholesome account of the Vilayat Khan phenomenon. Written with sympathy and elegance, this work in fifteen chapters, seeks to capture the personality of the sitarist and his art in all its complexities. As the elder of two sons (the other being Imrat Khan, the surbahar player, who had passed away in 2018) of the legendary sitarist Enayat Khan and Basheeran Begum, and grandson of Imdad Khan (after whom the gharana is named), Vilayat lost his father at the age of ten. Brought up under the strict discipline of their mother, how the brothers flourished against extreme hardships makes a compelling narrative. Khan’s life was so integrated with his music that analysing one without the other seems impossible. In fact, the sitar was an extension of his body. Born in an environment of music, he continued with the relentless sadhana (riyaz) that his father and grandfather were known for. It was not only the nature and nurture but also the nature of nurture that made him what he was. Though Calcutta was no longer India’s capital, it continued to spawn creativity in every field—art, science, politics and music. No wonder Calcutta occupied a special place in his heart and he desired to be buried there. Devidayal has traced the evolution of Vilayat Khan—the handsome man and the awe-inspiring artiste—through his early days in Gowripur to Calcutta, Delhi, Bombay, Shimla, Dehradun, Princeton and other places in India, Europe and the US, visiting each location where he had spent years of his life and meeting his relatives, friends, and disciples, weaving a story that is both interesting and truthful. The man, with all his contradictions, comes alive, warm, humane, charming and romantic, at the same time envious, insecure, whimsical and authoritarian. The development of Vilayat Khan’s unique music style—popularly known as the ‘gayaki ang’ (the vocalist style), as if he sang through the sitar, was influenced by his early training by vocalists (Khan himself used to sing well) and complemented by his innovation of a six-stringed sitar. His phenomenal rise as a star musician proceeded together with his flamboyant lifestyle, exemplified by his love for expensive cars, beautiful women, choicest drinks, friendship with the rich and influential. Khan was commissioned by Satyajit Ray to score the music for Jalsaghar (The Music Room, 1958) that won the Best Music award at the first Moscow Film Festival. When Nehru fell ill, it was Khan who was invited to play the sitar by his bedside to soothe his nerves for a restful sleep. By his first marriage with Monisha Hazra, a sophisticated Calcutta lady, he had three children, Shujaat, Yaman and Zila. After the second marriage with Lisa, his son Hidayat was born. Khan’s domineering personality led to clashes with his doting brother Imrat as also with some of his closest ones. Monisha is quoted saying how certain rules required to be followed strictly. ‘If the Khansahib says “too much salt in the curry”, I repeat after him like a Vedic chant, “too much salt in the curry”.’ Devidayal provides intimate glimpses of these personal episodes as well. About two decades ago, I remember having attended a mesmerizing concert by Vilayat Khan and Bismillah Khan at the Siri Fort Auditorium in Delhi. Bismillah was explaining the unique features of Vilayat Khan’s style that brings out from the cognoscenti the spontaneous applause as ‘aah, aah’ instead of the more common ‘wah, wah’. The audience could not agree more. Devidayal’s work is a labour of love, written in evocative prose. Its appeal would have been further enhanced if there were more photographs and an index. 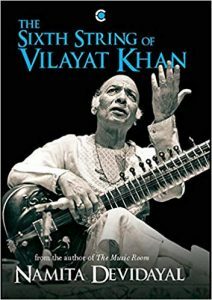 The book should interest every person interested in understanding why Vilayat Khan occupies a stellar position in the firmament of Hindustani classical music. Amitbha Bhattacharya, an engineer by education and a retired member of the IAS, has served in the erstwhile Planning Commission as Principal Adviser in charge of Education, Culture, and with UNDP, New Delhi. He now writes mostly on public affairs in national dailies.